On the main page I showed you how to make your own vanilla extract, but what else can you make with vanilla beans or vanilla paste? 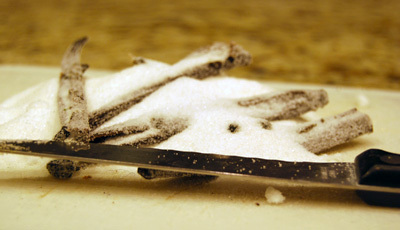 Vanilla sugar is a specialty sugar that is popular is European desserts. It isn't commonly available commercially outside of Europe, but it can easily be made at home. In place of whole vanilla beans I've also had people suggest using the empty vanilla bean packaging - thrifty! Directions: You can dry and then reuse the vanilla beans from making your homemade vanilla (recipe on home page) or use a fresh vanilla bean. Slice the vanilla bean then with the back of a knife scrap the seeds or "vanilla caviar" into the jar with the sugar. Take the pods and stick them in the sugar so they are mostly covered. It's fine if the tops stick out a 1/4" or so. If they are too tall just cut them down to size. Allow the sugar to absorb the flavor for 2 weeks or more before using. Also, by replenishing the sugar you can keep using the vanilla pods for 12 months or longer if you use a tightly sealed jar. Homemade vanilla sugar really goes great in desserts that also use vanilla extract. It really enhances the flavor - just use this in place of regular sugar. Just reserve the pods when scooping or use a colander to sift them out. Try vanilla sugar with blondies, sugar cookies, cheesecakes, pancakes, root beer and homemade ice cream. Directions: Combine half-and-half, sugar, cornstarch in a saucespace. Stir to mix. Split the vanilla bean and scrape the seeds or "vanilla caviar" from the pod (you can reserve the vanilla bean pod for another recipe like Vanilla Sugar). Cook over medium heat until it thickens, stirring continuously. Beat the egg yolks in a bowl and then gradually add the cream mixture, stirring continuously. Reduce heat to a simmer for 2 minutes, still stirring. Remove from heat and stir in butter. It should now be a custard consistancy. Pour custard into service bowls/ramekins for serving. You can top each with vanilla wafers and raspberries. Cover and refridgerate until ready to serve. Directions: Vanilla bean homemade ice cream is one of my favorite desserts. Mix the half-and-half, sugar and vanilla bean in a large saucepan. Heat to a simmer. Remove the vanilla bean and let cool. Dry, then split the bean lengthwise and scrape the seeds or "vanilla caviar" out. Mix the seeds in and then add the whipping cream to the mixture. Cover and chill for about 4 hours. Add mixture to your homemade ice cream mixer (see links to right). When adding just use the basic homemade ice cream recipe that came with the mixer and simply add in your vanilla bean mixture. A glass of warm vanilla milk is the perfect thing to carry you off to sleep. The rich aroma should ben enjoyed as much as the milk itself. Wrap yourself up in a warm blanket in front of a fire and enjoy! Directions: Add milk to sauce and start cooking over low heat. Split the bean and scrape out the seeds or use vanilla bean paste to add to the milk. Stir in the sugar and spices. Continue stirring for 2-3 minutes until the desired temperature is reached. Top with whipped topping (if desired) and serve! Vanilla bean paste is a nice alternative to vanilla extract and is well-loved for the specks that show up in the finished product. It's extremely easy to make and can be used right away unlike vanilla extract. This can be used as a straight substitute for vanilla extract. Directions: Cut the vanilla beans in half and place on pan covered with parchment paper. Allow for room between each vanilla bean. Dry the beans in the oven at the lowest temperature (175°F or so). Dry them for 30 minutes. Check to see if they are brittle, if not then continue to cook and check every 10 minutes thereafter. Alternatively you can air dry them in cool, dark place for a week. Once dry, cut the brittle vanilla beans into small 1-inch pieces and run through a coffee grinder in small batches. Add the syrup 1 tbsp at a time to find the proper consistency. It should be a thick, slurry consistency with only enough syrup to make it scoop-able. Some readers have replaced 1-2 tbsps of the syrup with vodka to increase the flavor and allow it to keep longer. Recipe adapted from Daily Bread Living. Good quality vanilla beans can last about 2 years if stored properly. Here are a few tips for purchasing, storing and using vanilla beans. You probably knew that vanilla beans should be stored at room temperature and in an airtight container, but did you know that you should air them out every few weeks? On the homepage I provided several links for where to buy some of the best extract grade Madagascar or Bourbon vanilla beans. Continue reading for a history of the vanilla bean and where to buy quality Mexican, Tahitian and other varieties of vanilla beans. Vanilla sugar is a specialty sugar that is popular is European desserts. It isn't commonly available commercially outside of Europe, but it can easily be made at home.